We provide our clients with a wide variety of services to ensure the health and wellness of your horse. We are able to evaluate your horse’s specific needs and set up programs that work for you. We are happy to work with clients to combine calls and set up stable days for shots, dental work, or other services. Dr. Matt is also willing to provide educational talks and demonstrations. Click here to see a list of Dr. Matt's upcoming stable and area calls. 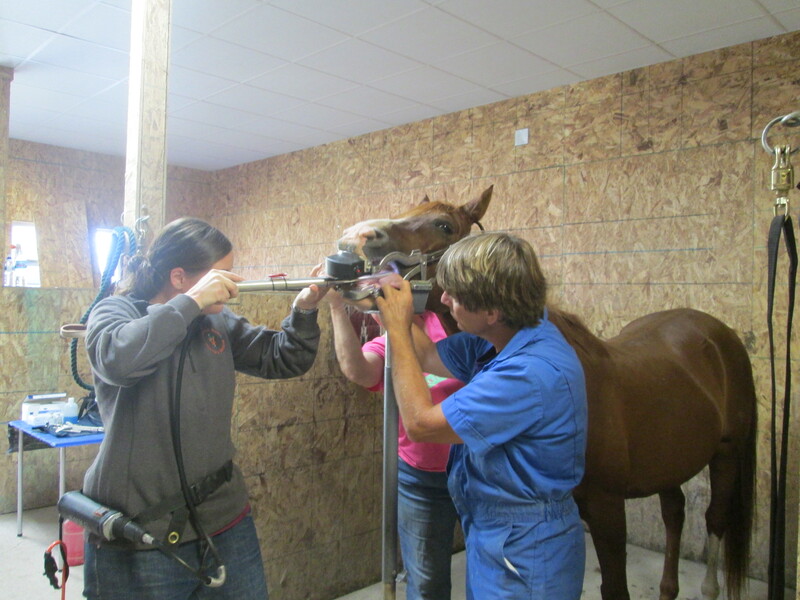 During a dental exam, Dr. Matt Schaefer employs the use of a full mouth speculum with the horse under light sedation. Only by doing this can any one evaluate the entire mouth. This then allows correction of any abnormalities present, using an array of dental equipment, including hand floats (files), motorized burrs and motorized files. Dr. Schaefer’s experience and these tools allow the procedure to be quicker and more efficient than a typical float. He can then focus on the abnormalities or problem areas on each horse. Most horses are back to normal and have a better overall appetite and attitude than before. DVS Equine Services makes sure the client receives a dental record after the work is done and strongly encourages the owner to be present. Many of Dr. Matt's newsletters deal with equine dental issues and why regular dental work is essential to your horse's overall well-being. Please call the office with any specific questions or to set up an appointment. Dr. Matt has recently added a periodontal unit to his dental equipment and is able to fill caries, improving the overall health of horses with significant decay and preventing more serious issues. In addition to dental work and routine care (immunizations, worming, Coggins), Dr. Schaefer is available for emergencies, x-rays, lameness exams, pre-purchase exams, health certificates, blood tests, joint injections, geriatric care, and nutrition consultations. The basics of any lameness exam or pre-purchase exams follows a predictable but consistent format: History taking; examination from a distance looking at conformation, symmetry and posture; palpation of limbs, tendons and joints; cleaning and hoof testing all feet; assessment of movement in lunging, straight away and flexion tests. This is followed by diagnostic analgesic (nerve and joint blocks), radiography and ultrasound if necessary. A plan is then developed after a diagnosis is reached. If a diagnosis is not clear, a plan is still put into place for either a referral or continued examination at a later date after a treatment is instituted. This may involve a shoeing or trim adjustment. Nevertheless, a lameness project may involve many professionals, all dedicated to the well-being of your horse. It is our pledge to maintain professional and ethical conduct with everyone involved. Click on the case links below for more information on typical procedures and diagnostic options (i.e., radiography, distal venograms, etc.). It is clear that a team effort is emphasized with the owner, veterinarians, and farriers.